Out with the old and in with the new. That’s what made me finally try a different recipe for cinnamon rolls. I had been making the same cinnamon rolls for years. I’ve changed the recipe to include pumpkin puree at times, but other than that, my homemade rolls have always been made the same way. Many moons ago, my cookbook library consisted of one book and that was The New Basics . The New Basics does not have a recipe for cinnamon rolls, and that’s why my collection grew to two books. Note: that book does have a recipe for sticky buns, but I wasn’t smart enough to think of checking for that at the time. I was at a bookstore, flipping through a few different general cooking types of books, and bought the tenth edition of the Better Homes and Gardens New Cookbook because it did have a recipe for cinnamon rolls. It served me well for years until I decided it was time to try the Saveur cream cheese cinnamon rolls that Joy the Baker made. The key ingredient, cream cheese, is in the dough not the frosting. After trying these twice, I didn’t completely sweep out the old. I realized there were a couple of details from my stand-by method that I couldn’t abandon. The dough ingredients were much like those for my old rolls other than the use of cream cheese, but there was a difference with the butter. For the new rolls, the butter was to be softened to room temperature and then kneaded into the dough with a dough hook on a mixer. It didn’t work itself into the dough very well, and the first time I ended up kneading a bit by hand to be sure the butter was incorporated. The second time, I warmed the butter to almost but not quite melting as I always did in the old version and then didn’t have to knead by hand. Then, after the dough had doubled in size, it was rolled into a ten inch square, and this is where the cream cheese was added. Softened cream cheese was spread on the square of dough, and the dough was folded almost like folding butter into homemade puff pastry which I still haven’t attempted. So, the dough was folded into thirds like a letter and then turned and folded again. Then, it was rolled out into a large rectangle to be topped with fillings. This new recipe suggests brushing the dough with melted butter, but again I reverted to my old ways with the butter. The first time around, the melted butter seemed to run out of the rolls and the bottoms browned too quickly as they baked. So, the second time, I spread very soft but not melted butter on the dough just like old times. A topping mixture of brown sugar, cinnamon, cloves, maple syrup and granulated sugar was spread on the buttered dough, and I included pecans and raisins one time but not the other just to mix it up. Then, the dough was rolled and cut and the rolls were placed in a buttered baking dish. You can either let the rolls rise for two hours and bake them, or you can place them in the refrigerator overnight. If refrigerated, they should come to room temperature before being baked. 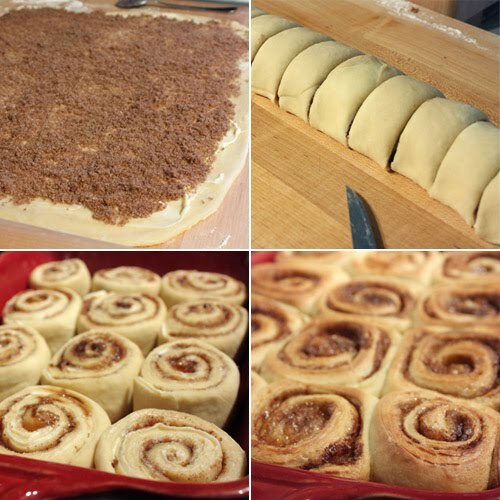 Old recipe or new, it’s hard to beat the aroma of homemade cinnamon rolls in the oven. When they were baked and cooled, they were topped with a simple confectioner’s sugar frosting with some maple syrup in it. This is a richer version of a cinnamon roll than my old recipe, and the dough was tender and incredibly good. In the end, I don’t think the old will be thrown out since it almost seems like a light recipe now, but I’m definitely keeping the new. I’m submitting this to Yeastspotting where you’ll find some seriously well-made bread. I am so past due for reading your posts (I'm systematically going through my reader in alphabetical order) but there was no way I was going to put this on the back burner! Wow!! I would give TWO limbs for just one of these rolls. I love that you incorporated tried and true methods with a new recipe. I bet these rolls must be very yummy coz you have put cream cheese in the dough! wow...Cinnamon rolls with cream cheese!! Lisa, this is simply irresistible! These look so good. I love The New Basics. I use it all the time. 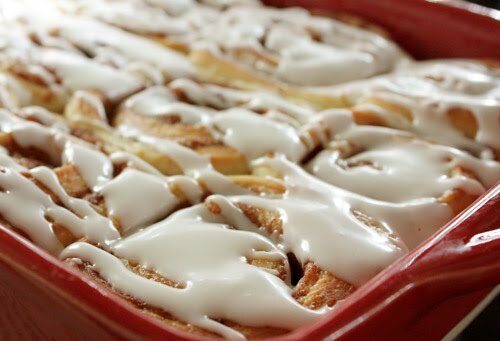 Pioneer Woman also has a really good cinnamon roll recipe. All Our Fingers in the Pie: I have her book and will have to try those next! I always associate cinnamon rolls with my mom, and hers were amazing. Yours are looking much the same, I am going to have to try these for myself! nothing better than extra special cinnamon rolls.. Such hard work for such pretty rolls. I'm glad you have enough experience as a baker to know what works and what doesn't. I think these look incredible. These look so irresistble! 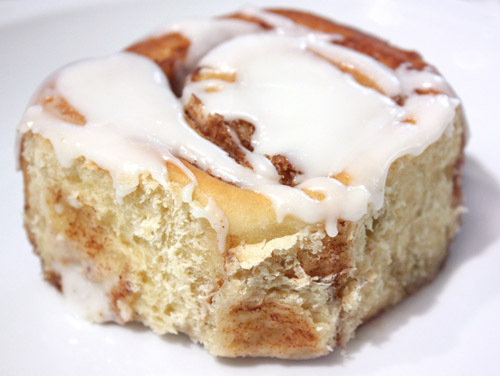 Wow, I just want to take bite--cinnamon rolls always make me nostalgic for my childhood. I haven't tried to make my own cinnamon rolls yet, but just looking at your pics make me want to get into the kitchen right now. OMG, those look irresistible! So moist and fluffy! I've been wanting to try cinnamon rolls for awhile now. i've been hoping to try the pioneer woman's, but it makes so many it intimidated me. yours look great though! I've made this before, and it is beyond amazing. YUM! Your main photo is awesome. It's one of the best I've seen of frosted rolls. I'm ashamed that I don't have a cinnamon bun recipe. Old or new. It's midnight here, and I wish I had one... :( Yumm! Aw... these rolls look crazy good. I, too, have a cinnamon roll recipe that I've been using for years. Guess it's about time I tried something different. Cream cheese in the dough sounds really good. What a scrumptious cinnamon roll! I love the cloves and maple syrup - a nice little twist. They are beauties and I love cream cheese dough...very nice. Gorgeous! The cream cheese in the dough sounds amazing! oh lisa, you temptress. of all the recipes with which to experiment, those for cinnamon rolls must be the most rewarding. i like where you're going with this, particularly with the use of maple syrup! Exceptional site, really way past the ordinary. Love the recipe, clean, crisp photos and easy to follow. I shall be sure to return for another bite of this deliciousness. These look incredible. My mom always makes cinnamon rolls in the winter - and every Christmas, too -- and even seeing a photograph of cinnamon rolls makes me think of her. I love the sound of cream cheese...yum! I don't think there is anything better in the morning than a hot cinnamon roll. And yours look delicious. What a super idea to add cream cheese. That must make these rolls heavenly! Ok Lisa, you really don't want me to fulfill my resolution of eating less sugar, do you? LOL. They look delicious and the addition of cream cheese is just making me crazy! Oh I can just smell the rolls coming out of the oven. I'm such a lazy baker, I almost never make rolls. My mom used to make them a lot. Should start a new trend for myself. And the cream cheese sounds inspired. I haven't had a cinnamon roll for so long. Yours look perfect! I'm way overdue! Waw,...Lisa!! these cinnamon rolls sing to me!! I woud like 2 rolls please! You are seriously killing me here. Hah! Gawd, I just want to pull off one of those yeasty, soft rolls, especially because you put maple syrup in the frosting. Perfection! Oh my..this looks so good! I've always wanted to try making cinnamon rolls, this sounds like a keeper with the cream cheese in the dough! Mmmm... cinnamon rolls! They are my favorite and I haven't had one in a while! I want to make these asap! I would make these for the smell alone! There are only a few things that beat cinnamon in the lovely smells department! Everyone must be drooling over these. The pan would be wiped clean in minutes. These look insanely fantastic! I used cream cheese in dough for the first time a few weeks ago when I made rugelach and I loved the texture. Beautiful job! OMG.. lip smacking good. I cannot resist cinnamon rolls and the way it makes the house smell is insanely good!!! Looks beautiful. Imagino cheiro na hora q estavam no forno.